The fish and chips at the Perch in downtown Chandler is a hit. The Perch is located in a little nook in downtown Chandler. This hidden gem is welcoming with friendly staff and a beautiful set restaurant. Trees surround the center area that have cute black tables and chairs for seating. The trees hang like a canopy and are covered in green liveley leaves and twinkly lights. Strategically placed twinkly lights hang from tree to tree and even some ornaments to get you in the christmas spirit. Now on first glance this restaurant looks completely normal but on closer look there is something incredibly different about the restaurant. There are birds everywhere. From the wild birds living in the trees above singing songs to the big exotic birds living in the homes built for them all over the outdoor restaurant. This restaurant definitely is not your everyday restaurant. The birds there are all rescues. They have found their forever home in this restaurant and are taken care of extremely well. There homes covered in plaid and black blankets for the winter to keep them warm and their houses have plenty of space and places for them to sleep, perch and even play on. There are over 50 brightly colored tropical birds total. On the Perches website they have details on the birds including a description of their personality and a cute picture to go along. There is also a note from the owner about the birds and her reasons behind having these beautiful birds. “ Every year thousands of pet birds are abused, neglected, and abandoned. Many people purchase a pet bird because they want a unique pet, but fail to research what it takes to provide these amazing creatures the necessary care they need to thrive in captivity. We dedicate our time and energy to helping to rebuild trusting relationships with unwanted, abandoned, abused, and neglected pet birds and give them a loving forever home. We do not breed, buy or sell our rescue birds. Our primary goal is to provide a second chance and lots of love for these birds.” The fact that this beautiful restaurant is also used as a rescue center for neglected and abused birds to get the love that they deserve make everything about this restaurant even sweeter. The food is very delicious and is served in huge portions. When I went I ordered beer battered fish and chips which cost 15 dollars. It came with three huge fish fillets and thick cut wedge fries. 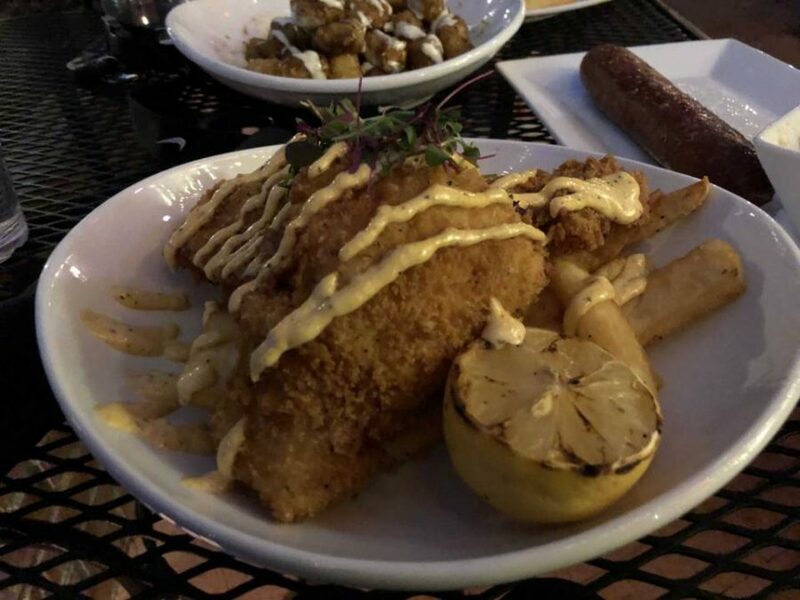 The breading on the fish was crunchy and flavorful and the fish was perfectly cooked falling apart basically with every bite, the chips were very tasty as well. I also ordered the perch pretzels which were soft and warm. They were salted which added to the flavor of the cheese dip the came with it on the side. As I waited for my food I walked around interacting with the birds that would dance and sing. This restaurant stole my heart with its chirpy birds and uplifting environment. The fact that this place is doing so much good for the lives of birds that would have been forgotten about is so beautiful and positive. For animal lovers like me this was a dream and I would ten out of ten recommend.